Opened with utopian ideals in 1971, and largely closed to the public in 2012 amid civic uncertainty, Ontario Place is hosting an art festival this month. Here, works by Ben Watt Myers (foreground, created from landfill cast-offs at Leslie Spit) and Acapulco (background) speak to the site as detritus and monument. Photo: Bryne McLaughlin. I have two distinct memories of Ontario Place. The first ranges back to the late-1970s, when, as an eight- or nine-year-old I found myself nervously seated in what seemed like the near-vertical drop of the geodesic Cinesphere—the first (and at the time, only) permanent IMAX theatre in Canada. Going to Ontario Place then felt like an event, and the massive, six-storey projection of cross-Canada wonders that followed, including swooping and diving aerial views over Niagara Falls and the Rockies, blew my childhood mind. The second came 15 years or so later when I was among an army of university students with summer jobs at the sprawling waterfront complex. By that time, Ontario Place had dropped most of its original intentions as an Expo 67–inspired showcase of cultural, technological and economic achievements. Instead, a theme-park array of waterslides, bumper boats and bungee jumping had become the main draw. The site’s modular suspended pods—an architectural feat when they were constructed—made a great place to dodge a supervisor, but otherwise remained shuttered. So it was with mixed feelings, and a definite sense of personal curiosity, that I returned once again to Ontario Place earlier this week in advance of In/Future, a 10-day festival of site-specific art installations, performances, film and video screenings and music spread across the site’s mothballed west island. Ontario Place has been largely closed to the public since 2012. Various re-development schemes for the prime government-owned property have surfaced, from a casino complex to a mixed-use commercial/residential district. To date, though, Ontario Place’s future remains in limbo. For In/Future organizers and curators Rui Pimenta and Layne Hinton, this stasis between collective history and future uncertainty make the site a perfect “litmus test” to think about the present. As Hinton explained during a walk-though of the installations in progress, the various incarnations of Ontario Place—initially as a mirror of late 20th-century utopian visions, then as a site of mass (some might say, dystopic) entertainments of amusement-park spectacle, then as an abandoned civic relic, set up a timeline that is constantly shifting between dreams of a potential future and the failed realities of the past. “The future is an impossible idea,” says Hinton, “as soon as we arrive there, we’re already in the present. And to learn about the present, we look to the past.” What that conundrum says about now is what In/Future is all about. With site-specific works by more than 50 national and international artists and collectives installed throughout the west island, along with screenings of 44 artist’s films and videos (plus six of the original IMAX films) in the Cinesphere, and parallel daily programs of music, talks and workshops, “In/Future” is a response to present ruin as much as it is an exploration of past/future ideas. Originally designed as a pavilion celebrating the province’s north, the west island’s overgrown pathways and disemboweled exhibition silos, not to mention the remnants of its centrepiece “Wilderness Adventure” animatronic flume ride, have been scavenged and refashioned by artists into a series of both complex and subtle interventions. Following a pathway at the base of a false rock face leads to the former flume-pump room and Max Dean’s stage-lit sculptural diorama The Gross Clinic (2016). Inspired by Thomas Eakins’s classic painting of a 19th-century medical theatre, and by the triage that Dean and his studio team undertook on the broken and weather-beaten mechanical figures that once populated the course of the ride, the scene also has something of a Frankenstein quality to it, as if the forgotten figures have been secretly planning their existential escape. In Cole Swanson and Jennie Suddick’s Kuckuckshur (2016), two flume-ride control towers have been modified into giant ornate cuckoo clocks complete with seed-encrusted pinecones to attract local birds, a kind of natural timepiece that marks the inevitable return of the site’s faux-wilderness props to an untamed existence. Similarly, Shannon Gerrard, Annyen Lam and Danica Drago’s BUILDDESTROYBUILD(2016) covers a walkway under the flume with a viral overgrowth of delicately knit and ceramic moss, fungi and a wasp nest. At the former end-point for the ride, Michael M. Simon’s Piece Tower (2016) offers a vertical tent-city built from scaffolding and camping equipment, a hive-like counterpoint to official proposals to turn the west-island site into yet another residential condominium complex. Resting on the peak of an artificial mountainside, Robert Hengeveld’s kinetic tree sculpture, SSSPUN (2016), slowly rotates in one direction and then reverses as a subtly absurd signpost of the false dynamics embedded in the site itself. Final touches were underway on many of the other works at the time of my preview visit. Inside the site’s looming exhibition silos, for example, immersive installations by the likes of Gareth Lichty, Ed Pien, Lyla Rye, Greg Staats, Simone Jones and Laura Millard, Heather Nicol and Oliver Husain, among others, promise an elemental sensory excursion. 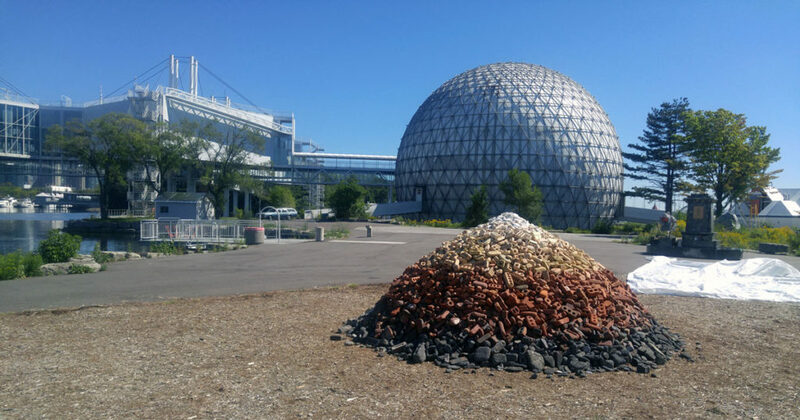 In the shadow of the Cinesphere, Ben Watt Meyer’s neatly stratified rubble pile, sourced from the Leslie Spit, hints at the buried histories below Ontario Place’s surface (the site was largely built from infill gathered from subway construction and financial district development), while art collective Acapulco’s sculptural accumulation of found detritus puts a wry critical turn on the value of public art as a future monument to a discarded past. As for the Cinesphere itself, each evening during In/Future, performance artist Mary Coble will scale the structure to transmit a series of protest messages in Morse code. It’s a challenge designed to not only confront the iconic architecture of the site, but also, whatever the future might hold for Ontario Place, to activate the utopian ideals it represents once more in the present. Bryne McLaughlin is senior editor at Canadian Art. In/Future opens on the evening of September 15 at Ontario Place, and runs until September 25.